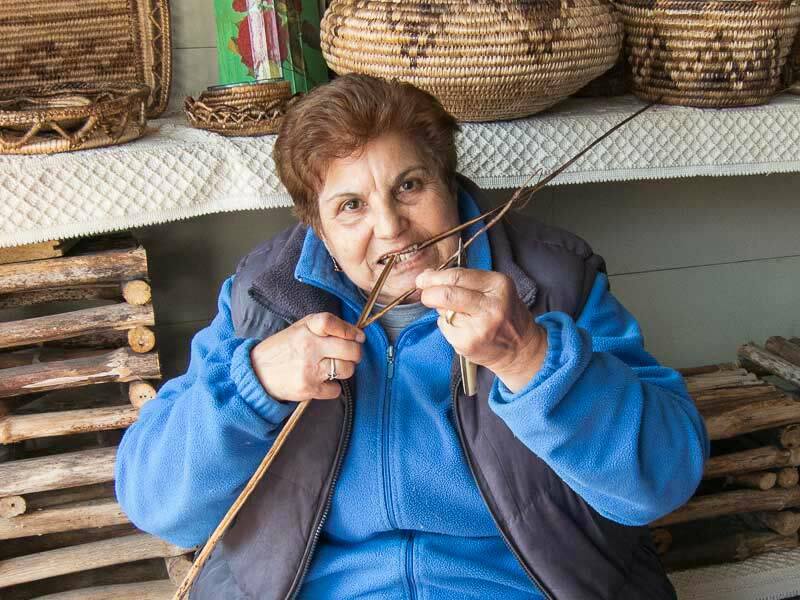 In the Flussio area east of Bosa there still exists a pocket of traditional basket makers who use the stems of the asphodel plant for their baskets. The baskets made in Flussio aren't (only) for tourists. On the day we visited, the sidewalk in front of the garage workshop with crowded with baskets drying in the sun, destined to become gifts for the attendies at an impending wedding. Our short video has a basic translation of the entire process of making these traditional baskets, from the harvesting of plants to the long process of aging and drying the stems, to the use of a cattle shin-bone awl called su raju to facilitate the weaving. It's no wonder these cost more than machine-made baskets. It's a dying art. Buy some if you appreciate hand-made artisan goods. They're light and transportable. The Video opens with a mural showing the basket weaving from the nearby town of Tinnura, a mural town in Sardinia, which is also marked on the area map below. The Asphodel is a perennial native to temperate Europe, growing in places with well-drained soil and abundant light. It has white or yellow flowers. Sardinians also make honey from the bees fed on Asphodel. Flussio is easily reached by car from Bosa, a colorful town where you'll find many hotels, a river, castle and beaches. We recommend a stay in Bosa or Bosa Marina. To stay near Flussio, a highly-rated B&B 1.3 km away from Flussio is B&B S'Alzolitta. Here is a list of other hotels near Flussio. 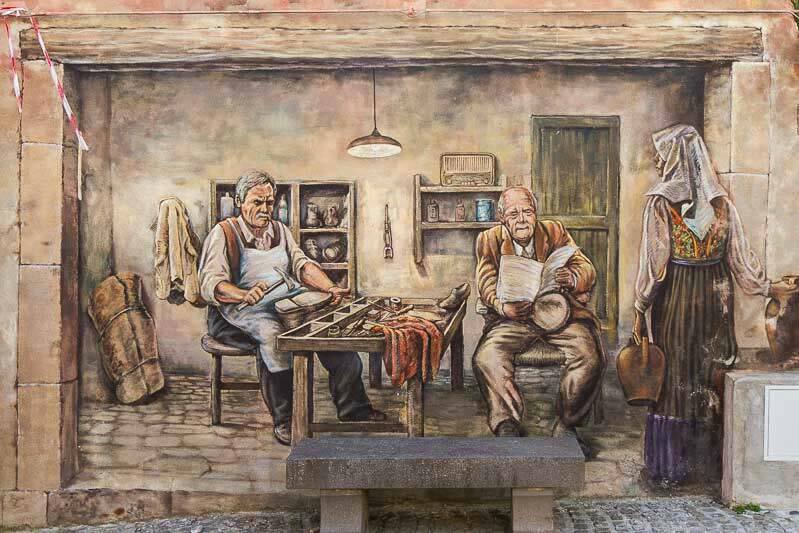 The nearby village of Tinnura is a mural city, I highly recommend you visit it (simply by driving through on the main road and stopping to see the murals). The location is noted on the map below. For impressions and a travel guide to Bosa, see: Bosa, Sardinia. Summer is peak tourism time. It can be very hot during this period. If you'd like to go in the off season, you may wish to consult the weather and climate charts for Oristano. Our visit happened at the end of March and we had fine, sunny weather. If you don't have a car or you just want someone else to lead you to the best things in Sardinia chosen for your tastes, you may wish to hire a guide to save time and get a good translation of what's going on. Remember that the women who do these crafts sometimes don't speak Italian all that well (Sardo, the Sardinian language, is their first and native language), and you may need an interpreter even if you speak Italian. We recommend Paola Loi, who took us on our trip down the west coast of Sardinia.